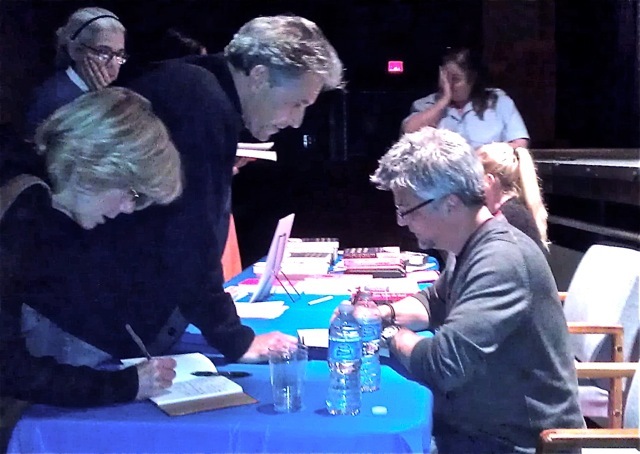 Stein’s appearance marked the first in the initial season of the Malibu Library’s ‘author events’ and it was terrific. He read from his wonderful novel, told personal anecdotes related to the creation and publication of the book including how his then-agent told him that no one would ever read a book narrated by a dog and that no one would ever be able to sell or publish it. He didn’t gloat but then again he didn’t have to, since the book has garnered all sorts of praise, spent 150+weeks on the ‘best seller’ list, earned a gazillion dollars and is now being made into a major film by Universal Studios. He was charming, funny, serious, insightful – in short, it was the author as performance artist par excellence. With my first two author ‘events’ fast approaching (details to follow shortly), this newbie was taking serious notes. I couldn’t help thinking that, unlike Garth’s racer hero, Denny, my issue is raging in the rain, the sun, the snow, the fog or just about any condition you can think of. If you’re wondering what I’m rambling about, you need to get a copy of GIMME SHELTER. And while you’re buying books, if you’ve never read Stein’s gem, get it. And you tough guys, be sure to buy a box of Kleenex, too, because you’ll need it.